Even if you’re unfamiliar with the title, you will recognize this song. It’s one of those great works of music diminished somewhat by overuse in movies and television, and yet it still electrifies the spirit and rumbles with thunderous emotion. 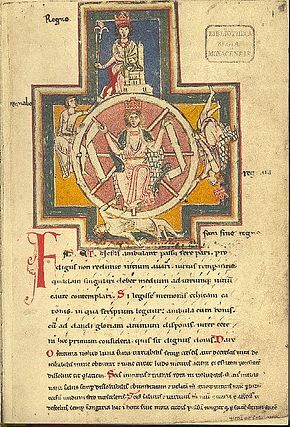 Originally a medieval poem lamenting fate and fortune (Fortuna being a Roman goddess and a personification of luck), O Fortuna is part of a larger collection known as the Carmina Burana, which is Latin for “Songs of from Beuern” (“Beuern” is short for Benediktbeuern, a city in Germany). Anyway, the 13th century Carmina Burana manuscript contains 254 poems and songs, written by the irreverent Goliards, a group of students and clery who wandered, drank, and mocked the Catholic Church. That’s about all I’ve managed to find out this evening, but my curiosity is definitely piqued by these young rebels of yore. German composer Carl Orff based his own “Carmina Burana” on 24 of the original poems. Set to music in 1936, his work begins with O Fortuna. What’s great about this YouTube video is that it displays the Latin lyrics along with English subtitles. You might find them “depressing” — perhaps they are, but the music ends on a triumphant note. Does a captain hide below deck when a violent storm threatens to overwhelm him? No! He lashes himself to the helm! I urge you to do the same. If we don’t squarely acknowledge Fate’s monstrous power over us, what kind of humans are we? Weep with me! Weep!